Computers are everywhere. We have them in our cars, in our phones and in our homes. Frequently, we work from home on our laptops, tablets or towers. Perhaps it is this universality that makes people tend to forget that cyber security is critical whether you are working remotely or on-site. 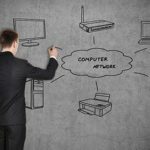 In fact, a Houston managed IT services company will tell you that network security is essential, no matter where you are working. Just because you are miles away or in the office does not mean that you can relax cyber security. All employees need to be schooled in the safest methods to prevent hackers and others from accessing your company’s computer system. In Houston, network security requires diligence, an established cyber security policy and a constant remembrance that anything you do can leave tracks that can be followed all the way home. Any Houston backup and disaster recovery service would advise you to teach your employees about cyber security so they can avoid unintentionally exposing your system to the slings and arrows of miscreants. Here are a few tips that your employees should internalize so that they do not carelessly expose your network to unwanted intruders who are bent on stealing your customers’ data and using it to benefit their own purposes. If you are a team leader or a foreman, your actions speak volumes to your underlings. It is important to set a good example and not leave such things as sticky notes with passwords affixed to your computer monitor. If they see your computer has notes all over it with password reminders, they may think that is an acceptable practice. Unless you set a sterling example, you have little room to criticize. Do not overburden your co-workers with enormous volumes of security documentation, the ISO 27001 is very useful but needs to be efficiently utilized and cut down into bite-sized chunks, if you don’t it won’t be read. It is much better to send out a daily security tip that will be more likely to be reviewed. Your tips can be about procedure, vocabulary or best practices. Mentioning recent news events that highlight security issues without blaming your employees is also a great technique. Do not let security issues slip between the cracks. If there has been a violation of your protocols, you have to treat it seriously. Any employee who is lax with their security needs to be taught the necessity of good habits. Make sure your employees understand that company-wide security is the goal and that all employees must make it their mission to keep your company’s computers safe. Checking up on your employees will show your leaks. There are plenty of phishing scams that hit email inboxes every day. By teaching your employees to ignore and delete such emails, you are going to alleviate a major source of distraction and possible intrusion. Always have a supply of security tools available for your employees. They are more likely to use them if they are easy to find and easy to use. Malware screening, data encryption and virtual private networks (VPNs) are essential for users who might not be likely to use them unless they are sitting on their desktop or readily available on your server. Scanner systems do not work if they are not used. The best way to be sure they are used is to make them easy to find. If you have concerns regarding your company’s security, you should give us a call at 713-974-3889. We will be happy to come to your business and assess your needs with a no-obligation estimate and appraisal of your system. We can also give you advice regarding any improvements we can suggest that will help keep your system secure. Security begins and ends with your very own employees, and they need to be aware of how they can help your company resist external attempts to break down your security systems. NCS Information Technology Group can and will fix any security problems your company might have. This entry was posted in Cyber Security and tagged Houston Backup and Disaster Recovery, Houston Managed IT Services, Houston Network Security. Bookmark the permalink.